- Publisher Here in one volume is Robert Farrar Capon's widely praised trilogy on Jesus' parables - The Parables of the Kingdom, The Parables of Grace, and The Parables of Judgment. These studies offer a fresh, adventurous look at all of Jesus' parables, treated according to their major themes. 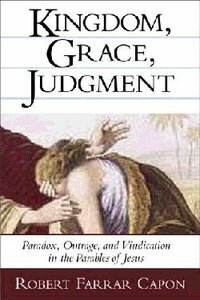 About "Kingdom, Grace, Judgement: Paradox/Outrage/Vindication in Parables"
Here in one volume is Robert Farrar Capon's widely praised trilogy on Jesus' parables - The Parables of the Kingdom, The Parables of Grace, and The Parables of Judgment. These studies offer a fresh, adventurous look at all of Jesus' parables, treated according to their major themes. An Episcopal priest and the author of many popular books, including The Supper of the Lamb (Modern Library), The Mystery of Christ . . . And Why We Don't Get It (Eerdmans); and a widely praised trilogy on Jesus' parables now available in one volume titled Kingdom, Grace, Judgment: Paradox, Outrage, and Vindication in the Parables of Jesus (Eerdmans). Today, Fr. Capon is working on his eighteenth book. He is an assisting priest at St. Luke's Church in East Hampton, New York, the Canon Theologian to the Bishop of Long Island. Robert Farrar Capon has had a life-long interest in food and cooking, which is reflected in many of his books, including several cookbooks. He was a food columnist for Newsday and The New York Times, and continues to teach cooking classes.